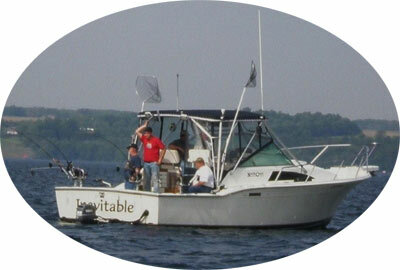 An Eagle Rock Charter is a great way to teach your family about fishing or entertain your clients. Your captain has spent the last 25 years as a full time fishing guide, and pro staffer for Cortland Line & Diamond back Rods. During this time he has set three line class world records and became a member of the prestigious 5 to 1 club (5 pounds of fish to every one pound test line). 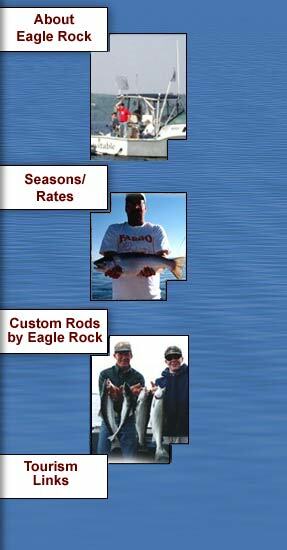 Glenn's wood handled custom rods match you with ultimate in light tackle sport fishing. Our season runs year round. Fishing on Cayuga lake from April through November and on the Salmon River, from our drift boat, from September through April. Full-time charter service. We spend 1500 hours a year on the water. Very short running times to fishing grounds. Cleaning and packaging of your catch included. All gear and tackle provided including custom made noodle rods from Diamondback, St. Croix and G. Loomis. Field tester for Cortland Line. 27 ft. charter boat with hard top and private bathroom. Pollution free waters; no lost days from wind. 4 stroke trolling engine, which eliminates all fumes and noise. YOU FIND THE TIME, WE'LL FIND THE FISH!